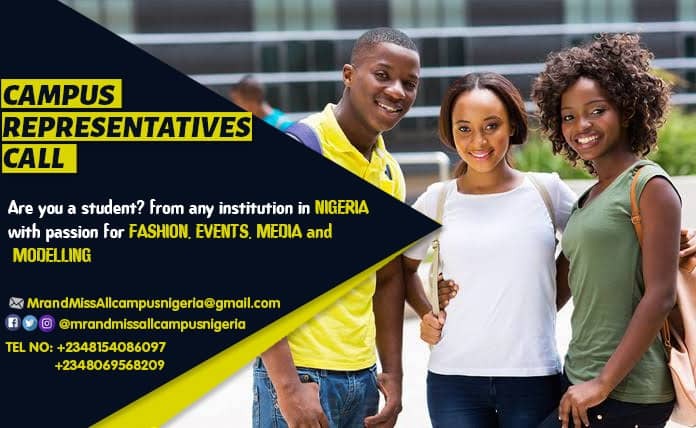 ORGANIZERS OF MR AND MISS ALL CAMPUS NIGERISis calling on vibrant, social media enthusiast, influencers, and intelligent young individuals to join her clique of campus ambassadors throughout the nation. The brand needs your help both to raise awareness of the cause across campuses in Nigeria. Our Campuses Ambassadors play a vital role in representing the rand at local events and functions, speaking about our work. • Assist to achieve our the organisation goals. • creating awareness of all our shows within your campus. HOW MUCH OF MY TIME WOULD YOU LIKE? • you get all brand merchandise and free entry to all our programme with logistics all settled. This role will be based within your local area, with the option to attend our events,if you wish to. 3. Application is free and easy.